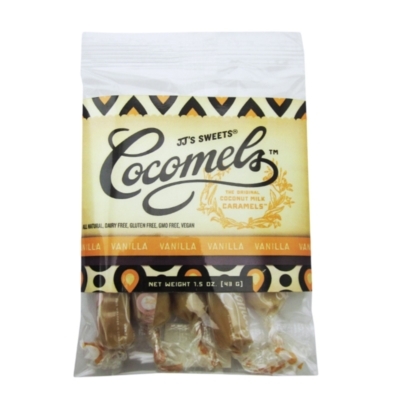 Bring a level of aromatic richness to the smooth sweetness of these Cocomels coconut milk caramels with a touch of Vanilla. The delicate bouquet of spice and sweet, savor and delicacy, that only Vanilla can provide, is carried so perfectly on the simple sweetness of these favored treats. Each package includes five pieces of individually wrapped candies, and each wrapper is fully compostable; even Mother Earth likes these candies!. Perfect for introducing yourself to this sweet bliss or even as a small gift for someone special.